Coolermasters' Ergostand III measures 385x280mm overall and according to the manufacturer can support notebooks with screens up to 17" in size. A 215mm diameter fan is mounted in the center of the stand and this draws air from the back of the unit before exhausting it out the front, through the fine metal mesh which measures 335x273mm. The speed of the Ergostand's fan is controlled by the fan speed dial at the upper left of the unit. The fan is so quiet it's hard to tell when it's on, so Coolermaster have added a white status LED next to the aluminum fan speed dial that stays illuminated when it's powered up. 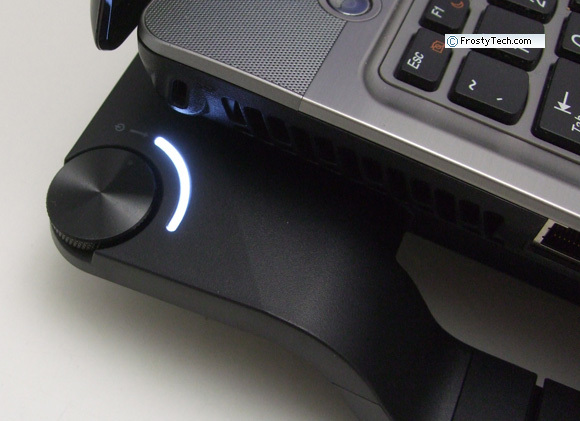 Rotating the dial adjusts fan speed from 500-800RPM, but the fan stays essentially inaudible the entire speed range. The rear of the Ergostand III contains the integrated stand and metal height adjustment bar. Air is drawn in from the back of the unit by the 215mm vanaxial fan (5 VDC, USB powered) and exhausted out the front of the stand, thus when it is laying flat there is very little airflow as the intake vents are pretty constricted. The fan is quite large but it doesn't drive a huge amount of air out the front of the Ergostand III - that would quickly become annoying. There is just enough airflow to circulate around the base of the notebook to help cool things off. Power to the Ergostand III is supplied via a USB-to-miniUSB cable that plugs into one of the laptops' five USB ports. 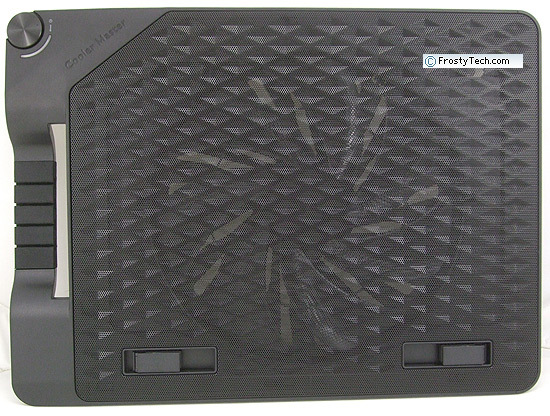 When the fan eventually gets dirty with dust or other debris, simply pop the metal mesh cover off for access to clean. With the metal mesh removed, we have an unobstructed view of the seven-bladded impeller. 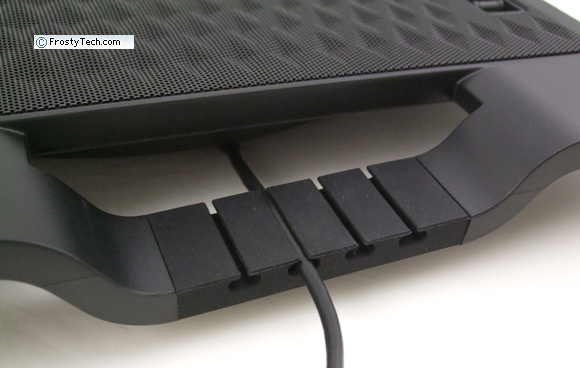 On the left hand side of the Ergostand III is an integrated rubber cable management device; this is used along with a couple plastic tabs on the rear of the device to route cables neatly to the 4-port USB 2.0 hub. The cable management part doubles as a convenient carry handle too. When the Ergostand III is connected to a notebook via the included USB-to-miniUSB cable, that enables the integrated 4-port USB 2.0 and 1-port mini-USB hub on the rear of the stand. That's about all there is to Coolermaster's Ergostand III; these are pretty simple devices that do exactly what you'd expect them to. 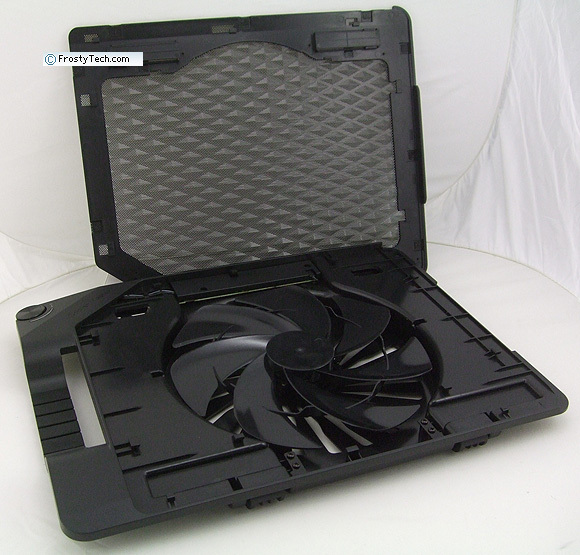 A little bit of airflow is all that's usually needed to prevent uncomfortable laptop-to-hand perspiration or stop a taxed laptop from constantly spinning it's loud cooling fan at full speed. Design wise Coolermaster got it almost 100% right with the Ergostand III... It's fit and finish are very nice, the metal mesh isn't flimsy and there's no issue supporting a notebook or tablet on the device comfortably. 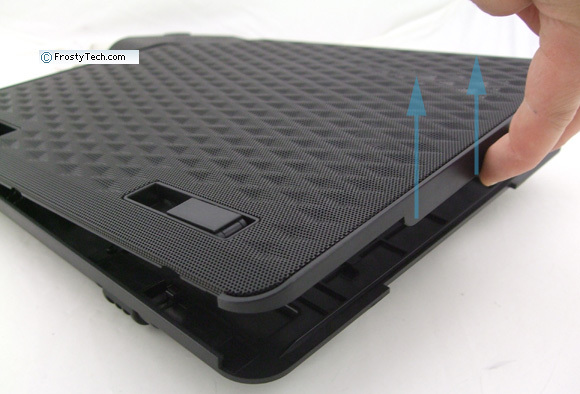 Integrated rubber feet even work to prevent scratches from repeated contact with your notebook. Aesthetically, the Coolermaster Ergostand III notebook cooling stand looks great and would certainly not be out of place in a professional's office. The problems we found with Coolermaster's Ergostand III are severalfold: The wire support which jacks up the stand is just sort of held in place by gravity. If you lift the entire device up with a notebook on it, say to move desks, the wire comes loose from the groove and the platform can easily come crashing down. In addition to that design oversight, when the Ergostand III is completely folded down, the fan really doesn't have any clearance left to draw air in. 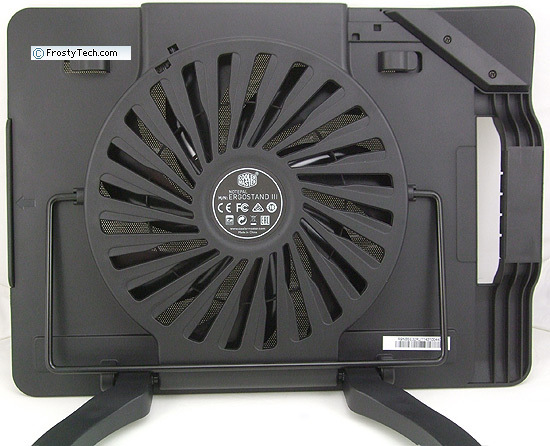 If you don't need the laptop elevated significantly, this prevents the fan from really doing all that much. The all plastic construction is actually a positive I think; we've tested a few units made of aluminum and tend to find these either have sharp edges which can scratch the expensive finish on a notebook/tablet or the metal is too cold to the wrist. Beyond that, we wish the USB power cable were retractable or stored in the cooling pad itself, such a small cable is prone to be lost when the notebook stand is being moved about or stored. Price wise, it's hard to swallow the $60USD cost Coolermaster are asking for the Ergostand III - that seems way too expensive for the task this fulfills. 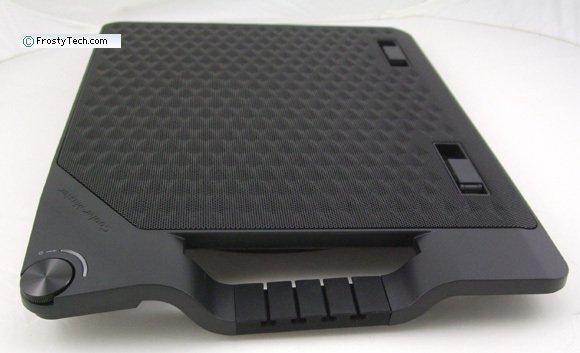 However, if you suffer the problem of excessive laptop heat, an notebook cooling pad such as this might just be the solution you should be looking for.